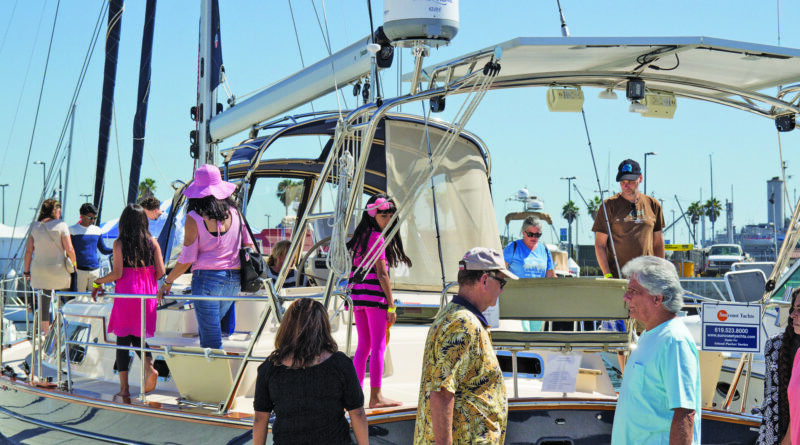 New in-water boat show comes to Cabrillo Way Marina, Sept. 20-23. SAN PEDRO — This September one of the newer in-water boat shows will return to L.A. Harbor at Cabrillo Way Marina, thanks to sponsors L.A. Waterfront (Port of Los Angeles) and California Boater Card. Now in its third year, L.A. Harbor Boat Show is a haven for recreational boaters who are looking to scout out new vessels, marine accessories and more. A chance to climb aboard a variety of trawlers, cruisers, sportfishers, sailboats, catamarans, motoryachts and other quality boats will be present. Attendees can browse marine engines or meet will skilled brokers to make a purchase on your dream boat. More than 60 exhibitors specializing across the marine spectrum will be at the show. While some of the activities and entertainment are still being considered, there will certainly be much for boating enthusiasts to enjoy. Sailing lessons and a dock lounge are just a few things that will be featured this year with more educational and recreational activities to be confirmed soon. Folks can expect other sources of live entertainment as well. The newly branded LA Waterfront is currently being remodeled to make way for San Pedro Public Market, the $100-million project that has high hopes of making LA Harbor a top tourist destination, but the area is still home to the popular San Pedro Fish Market and Restaurant, which will be open for business. Stop by to have a bite of fresh seafood. For patrons who are busy checking out the latest boat models and want to grab a quick nibble, food trucks and BBQ will also be at the event. Exhibitors for the show will be announced closer to the show. Those interested in obtaining a vendor booth can find out more by checking online or calling 949-757-5959. Adult tickets are $15 per person, active military get a $5 discount and children under 12 get in for free. Tickets will be available in advance online or at the door. Hours of the show for Thursday, Sept. 20 and Friday, Sept. 21 are noon-7 p.m.; Saturday, Sept. 22, 10 a.m.-7 p.m.; and, Sunday, Sept. 23, 10 a.m.-7 p.m. Parking is on the premises for $10 and a shuttle service will also be on offer. Cabrillo Way Marina is located at 2845 Miner Street at Berth 43 in San Pedro. To learn more about LA Harbor Boat Show, visit the website at laharborboatshow.com. For specific inquiries, contact the office at boatshows@goboating.com or 949-757-5959.